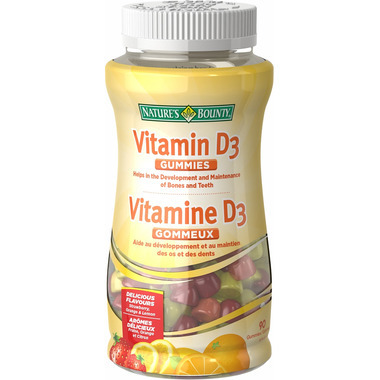 These Nature's Bounty Vitamin D Gummies are unique way to help you get your daily dose of Vitamin D, also known as the Sunshine Vitamin. Helping in the development and maintenance of bones and teeth, these naturally flavoured strawberry, orange, and lemon, gummy vitamins are something that you'll look forward to adding to your daily routine. Adult Dosage: Adults, take one (1) gummy daily. Non-Medicinal Ingredients: Black Carrot Juice, Carnauba Wax, Citric Acid, Corn Syrup, Dl-Alpha-Tocopherol, Fruit Juice (colour), Gelatin, Lemon Flavour, Orange Flavour, Pectin, Strawberry Flavour, Sugar, Vegetable Juice (colour), Vegetable Oil, Water. WARNING: KEEP OUT OF REACH OF CHILDREN. Store in a dry place and avoid excessive heat. Security seal. Love getting to take my daily vitamin D supplement with a gummy - it feels like a treat! Using these have been the first time I have really stuck with taking vitamin d on the daily. Great value, least expensive gummy vitamin d i could find. My sister refuses to take supplements that aren't in gummy form so this is great. Still, I recommend buying this when it's on sale. These gummies are awesome! I take all my vitamins and minerals by gummy now and I LOVE IT!! I rarely forget to take them anymore , like I used to with the pills. Love them all! Great product, easy to take, tastes great and supports my immune...what more could I ask for! Best texture in a vitamin gummy. Great taste and great price! Family favorite. These taste great. I actually want to take my Vitamin D every day now.